Yeru members can use the code bon2017 at checkout to receive 10% off! Yeru Bön Center and The Tibet House are pleased to co-host Latri Nyima Dakpa Rinpoche’s teaching of Tonpa Shenrab’s Profound Words of Wisdom. Yungdrung Bön generally known as the Nine Ways of Bön, can be categorized into three main sets of teachings. These three sets are known as the Outer, Inner, and Secret teachings (Sanskrit Sutra, Tantra, and Dzogchen.) Each of these sets of teachings is a complete system of spiritual development, that can lead the practitioner to attain enlightenment. Yungdrung Bön practitioners may choose to practice one, or more, of these sets of teachings, based on their capacity of understanding and the suitability of the practice. Latri Khenpo Nyima Dakpa Rinpoche will talk of the history of Bön, its traditions, it’s practice and its healing benefits to all sentient beings. This talk is the preliminary talk to this weekend’s teaching of Buddha Tonpa Shenrab’s Profound Words of Wisdoms. We welcome you to participate to this wonderful talk on Yungdrung Bön and to continue your weekend with the teaching of Buddha Tonpa Shenrab’s Four Profound Words of Wisdoms. Tonpa Shenrab, the Completely Enlightened One, the founder of the Yungdrung Bön religion, was born 18,000 years ago in the land of Olmo Lung Ring. 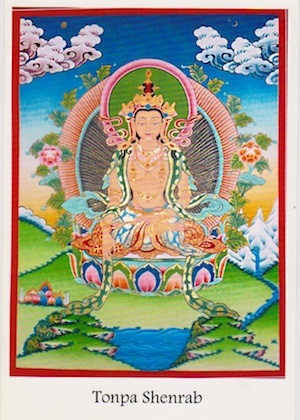 Before he attained enlightenment (Buddhahood), he went through the six realms of cyclic existence in countless births. He entered the door of enlightenment through the practices of accumulating merit and purifying himself, resulting in the attainment of the transcendental qualities of loving kindness and compassion. He is superior among all the exalted enlightened beings and is dedicated to the liberation of all sentient beings. 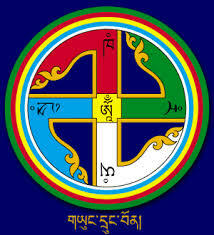 In order to rescue them, he turned the Dharma Wheel of Bön three times, as an antidote to all suffering.Today, through an unbroken lineage, the teachings of Tonpa Shenrab are the fundamental essence of Sutra, Tantra and Dzogchen. Tonpa Shenrab instructed his fellow disciples to be true practitioners by implementing the teachings of Bön in everyday life, to heal both the physical and mental blockage we hold within us. In this teaching, Latri Khenpo Nyima Dakpa Rinpoche will share Tonpa Shenrab’s Four Profound Words, guiding us through their meaning and how we can apply this wisdom in our daily lives to improve our wellbeing. The teaching will progress from an understanding of the Dzogchen view of Bön, to the right manner of conduct, to unconditional compassion. This teaching gives us the essence of Sutra, Tantra and Dzogchen, and how to realize the in our daily lives. 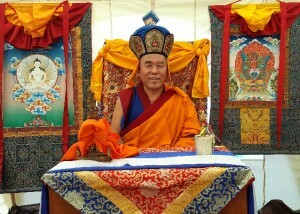 Rinpoche will also give us a deeper understanding of the Ten Perfections. He will teach us to apply this practice in our daily lives, beginning at a simple level and growing gradually with mindfulness and consistency. Discounts apply for early registration and membership to Tibet House and Yeru Bön Center. Registration is done through Tibet House. Yeru regulars can use the code bon2017 at checkout to receive 10% off! Latri Khenpo Nyima Dakpa Rinpoche is the lineage holder and abbot of Latri Monastery in eastern Tibet. Rinpoche received his Geshe degree (equates to a Ph.D in the West) in 1987 from the Bön Dialectic School at sMenri Monastery in Dolanji, India. Rinpoche’s early education came from his father, a well-known lama in eastern Tibet, and from Tsultrim Nyima Rinpoche, the lama of Dorpatan Monastery. Rinpoche later entered sMenri Monastery in Dolanji, India, the seat of Bön religion and education. There he was taught by His Holiness, the late Lungtok Tonpai Nyima Rinpoche, the 33rd sMenri Trizin; His Eminence Yongdzin Tenzin Namdak Rinpoche, the Lopon (head teacher) of all Bön education; and master Geshe Yundgrung Namgyal, a teacher of the Bön Dialectic School. Rinpoche has taught Bön teachings in the U.S., Europe and Asia since 1989. He is the founder and spiritual Director of the Yeru Bön Center in Minneapolis and Los Angeles; the Shen Ten Ling Bön Centre in Vienna; the Shen Chen Ling in Minsk (Belarus); Sharza Ling Institute in Poland; the Sharza Ling in Warsaw, Poland; the Sharza Ling Retreat Center at Zhedoa, Poland; the Bön Shen Ling in Moscow; the Bön Shen Drup De in Kharkow, Ukraine; and Yeru Canada. Rinpoche also is currently supervising a stupa project for world peace at the Kundrol Ling Retreat Center in Thailand. Rinpoche is the founder and President of the Bön Children’s Home in Dolanji, India, that provides housing, clothing, food and education for orphaned and underprivileged Bön Children from northern India, Nepal, Bhutan and Sikkim. His is also the Vice-Chairman of the LAC for the Central School for Tibetans in Dolanji. Rinpoche Yeru’s Hope for Tibetan Children, located in Minneapolis, which raises funds for the Bön Children’s Home and other needs for the children. Rinpoche is the author of Opening The Door To Bön, a guide for Western students of Bön.